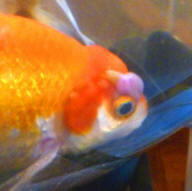 I have a large Oranda who has been quite lethargic for many months (I have indeed written to you about this previously). Physically she appears very healthy and has no blood in her fins or lesions of any sort. She is alone in a 72 gallon tank which has 2 Eheim canister filters and a UV sterilizer. I do a water exchange/gravel vacuum twice a week (or more if needed) without fail. Today I noticed that she had white discharge oozing out of her Wen- this is not the normal cottony growth that I sometimes see. I very gently palpated the Wen and more white discharge came out, approximately 1/8 of a teaspoon. The discharge is oozing from what appears to be a deep "cut" approximately 3-4 mm along the sulci in the Wen- the one that runs along the dorsal aspect and essentially divides it into a left and right hemisphere. It does not look like a hole- it looks more like the Wen has naturally separated along this line. There is nothing that the fish could have cut herself on- I have fish-proofed the tank. I looked at the discharge under a microscope and it appears to be free of bacteria- it looks, in fact, like cells. I can't find a single similar situation anywhere on the internet or in your archives. This does not appear to be HITH (?) but I am extremely worried that it could be an infection under the Wen or that the hole could allow bacteria to enter. The Wen otherwise looks healthy- I have attached a couple photos though I did not get one of the discharge and do not want to try to extrude more for the sake of a photograph. Does the Wen have a fluid layer between it and the skull or is this likely a cyst or infection? A bit more background- the fish stopped eating about two months ago: she became extremely lethargic and did not eat for three full weeks before perking up and acting normally again. She has been her usual self up until three days ago when she became lethargic again and refused to eat. Have you ever heard of this? What can you suggest? There are no aquatic vets in the area but I have located a vet who is enthusiastic to learn about fish patients. As a precautionary measure I will add a bit of sea salt to the water until I hear from you. I've perused it multiple times over the past month, but didn't see anything quite like what I have (or if it is there, I didn't see pics to make it clear). I have 7 fantail goldfish (1.5" - 3.5" body sizes) in a 75 gallon tank with a Hagen 110 filter, no new fish in the last year, water tests seem good. I moved about 7 weeks prior to the onset of the issue; I brought along some of their old water (7.2pH), and gradually introduced them to the new (well water, about 7.5pH), 10% at a time, but to do that, they were all in a 29 for 2 weeks. I do have a small amount of salt in the water- about 1 tbsp per 5 gallons. I change out about 6 gallons every week. Five weeks ago, one of the fish pretty suddenly developed a white spot high on a side, forward of the dorsal fin. I popped him over into a 10-gal quarantine tank with a Hagen 50, filled mostly with change-out water from the big tank. The next day, there was a dark center or streak in the bump, but then within a few days, it simply became cream to light tan colored, and hasn't changed in the last 4 weeks. He seems perfectly fine otherwise - fins up, eating well, but cranky about being in a smaller tank (his body's about 3" long). In hindsight, had I known he'd be in quarantine for more than a week or so, I would've set up the 29 as a quarantine, but I wanted to get him out fast, and only had enough change out water for the 10. I'm attaching 3 pictures to show the bump. At this point, I'd like to put him back in the other tank, since his health otherwise seems fine. Any ideas what this is, and if it is a problem, what I should do about it? Thanks in advance for your help, and once again, I do appreciate having this website to browse through to look for advice - kudos to you all for your efforts! 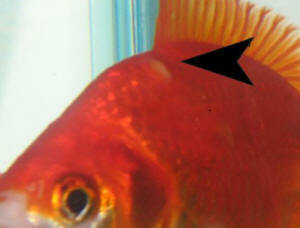 I wrote a while ago about a growth on the muscle along the spine of my goldfish. It had grown along the site of an old injury and at the time of writing had burst open. The surface has since healed but the lump has continued to grow. I am certain that this is not carp pox. I am wondering if there is anything at all that I can do to eliminate it- it is quite large and I fear may be spreading into the muscle tissue. It is about 1.5 cm x 1 cm x 1 cm. 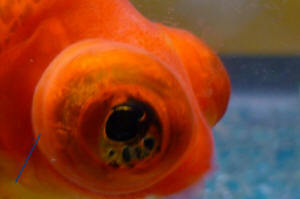 The fish also has spots of blood at the bottom of both eyes and has been bleeding into its tail- I had the fish on Medigold antibiotic food for 35 days suspecting a persistent case of hemorrhagic septicemia; the meds did not help and I discontinued treatment fearing the effects of long term antibiotic use. I am not sure if it is septicemia or if the tumour could be responsible since it is in close proximity to the head. I wondered if attempting to aspirate any fluid inside to try to reduce the size of the tumour might be an option- I certainly don't want to expose the fish to a bacterial infection but I don't want to let this continue to grow and then regret NOT aspirating. There are no aquatics vets anywhere near my area. I don't know what to do! I have great sentimental attachment to this fish as it was the first one I purchased (and the one that launched me on my goldfish craze). It has grown from a fry into a beautiful 6" long demekin. I am worried sick- is there anything I can do for my fish? I am moving the fish from its current 36 gallon tank to a 50 gallon (just waiting for the new tank to cycle. Nutrition shouldn't be a problem as my fish eat much better than I do (I'm not kidding). What is your opinion on the septicemia? The tail fins have quite a lot of prominent blood vessels and blood streaks in them and the eyes have small spots of pooling blood (and have had these for months). The size of the blood spots decreased with the medicated food but did not completely heal. Could this all be tumour related? Should I try to treat this before moving the fish to its new home? I have read that septicemia can be quite difficult to eliminate and am not sure what the best medication would be (my water has a pH of 8.2 so that is a consideration). I have found another brand of triple medicated food that I could try if you think this would help otherwise I could increase the amount of spirulina that I feed the fish. The fish will be alone but I will at some point wish to introduce one more fish to the tank. Laura here. I'm replying through a previous email u had sent re: one of my Orandas. I'm having a little trouble navigating through the web site since it was changed a little. I have another question, one of my Orandas has got two (UGLY) looking spots on his Wen looks like holes forming in his head. Is this a disease that you are familiar with? Please advise of any treatment that u maybe aware of. All of my water is balanced my two other Orandas are doing fine. I'm lost. Thank you for any advice. Thank you Bob for you reply. They are rather nasty looking spots. Like the skin is deteriorating around it, kind of reddish like infected. Started out small and have eaten away a good portion around them. Is that normal? Thank you so much I'm very relieved!! It just looked so bad I was very concerned. Wow, my little Oranda buddies are a handful..lol. Hope all is well with you, its storming here in Alabama. Have a good evening and thank you for your help. and 5+ nitrate. In this tank I have an Oranda, a Black Moor and 4 Comets. and the other 4 were peas with a fast day. Now that my Black Moor is having floating issues with the peas I am switching to lettuce a couple times a week to see if that helps. came out but he developed another one right next to it. That one popped as well and for the last couple of weeks that side has kind of been swollen and draining white cotton stuff. He is swimming fine and eating fine, he just looks uncomfortable. Should I be worried that there is still white stuff coming out? And I did notice some clear poop so I'm worried that he may be developing a bacterial infection. I did buy him so anti bacterial food that's still in the mail from goldfisconnection.com. Am I over reacting or should I get a breeder net and just keep him in there for the 14 days I need to feed him the medicated food? Is there anything else I can do? Your email has been deleted due to too-large graphic size. Re-size and re-send per our stated requirements. What is this disease on my partners goldfish. We thought it was a tumour, but looking at '14a' on your site, could it be Fish Pox. 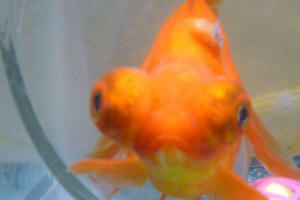 The goldfish is over 8 years old and has had this growth for over a year and we have tried an antifungus and bacteria product with no success. Although it is getting continually getting bigger, and looks like it is a number of 'sacks' joined together, one 'sack' has broken open and the 'tissue' inside appears to be breaking up in parts. It does not appear to worry the goldfish or affect its appetite of flakes and tidbits of prawns. It lost its (healthy) companion a few months ago so is now on its own in a 6 gallon aquarium. The aquarium has a filter and airstone some live and plastic plants and one third water changed at 6 weeks. Sorry about first email being rejected for picture size. I must have made a mistake on conversion somewhere. The tank measures 30" x 12" x 18" so a couple of sites tell me that's about 29 gallon (not 6 gallon). 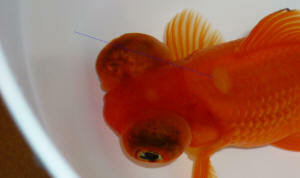 I have a lovely telescope-eyed goldfish with what appears to be a tumour or a fluid-filled cysts on its back, to the left of and proximal to the dorsal fin. 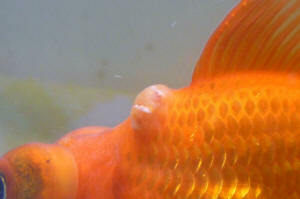 The fish is not in any distress, but the cyst has been growing over the past couple of months. that disrupted a few scales- no blood and it did not look very deep. I moved him to his own tank (mostly to get him away from the bully) and added salt to be on the safe side. The wound healed well and the scales grew back- everything was fine until I noticed that the scales were pushing up along the line of the injury. They have continued to pop up and now there is an oval cyst approximately 1 cm x 0.5 cm x 0.5 cm. It is exactly where the injury occurred. I am uncertain whether I should leave it, try to treat it with antibiotics (if it is building up fluid or exudate I fear it may eventually make the fish ill) or attempt to aspirate with a small needle. I am attaching a couple of photos (though the cysts actually appears larger in "real life" than it does in the photos). I am so sorry to trouble you again- I have been writing to Neale about a separate issue involving a different fish and tank and I feel such a pest! Thanks to you both for putting up with my many questions!!!! The trouble I am having is immediate- the cyst that I wrote to you about 6 days ago started to get a white, fungus-y looking line on it yesterday and today seems to have burst or opened up. I dabbed it with some Bio-bandage, did a water change and added 2 tablespoons of salt to the water but have not done anything else. I used a Q-tip to gently dry the area before dabbing on the Bio-bandage and a small amount of pale yellow exudate showed on the cotton. This fish is alone in a 25 gallon cycled tank. Water parameters are pH 8.2, ammonia zero, nitrite zero, nitrate 8, GH 8 degrees, KH 6 degrees. As you can see in the photo the cyst is open and I am very concerned about it becoming infected. Should I add a bit more salt or treat the water with an antibiotic for the couple of days? Since the fish is alone I can pull the cycled media and turn his tank into a hospital tank if need be. when he swims the fluid actually wobbles a bit so this is quite disconcerting. Could there be a connection? Should I be concerned about the fluid build-up and if so what can I do about it? so I think the fluid has been there for a while and I just hadn't noticed. 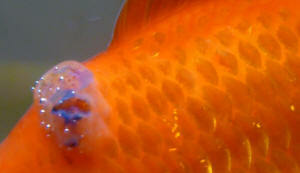 Our seven year old goldfish, Jojo, has what appears to be a blister-like growth over one eye. This began two months ago as a smaller, slightly raised spot and since has grown. We routinely change 40% of the water in her 16-gallon tank every week, and tried treating with Maracyn after her symptoms started to worsen. Her tank-mate, Mojo, is the same age, always lived in the same tank, and shows none of these symptoms. Can you tell from the photo what her condition might be and whether or not it is treatable?